First through third graders will learn basic music concepts through movement activities and music games. They will also learn about the instruments of the orchestra and the classical time periods. In addition, students will learn to read musical notation by playing Orff instruments. Fourth graders will learn to read and write musical notation by playing the recorder. Students are motivated to practice their recorders at home using the Recorder Karate curriculum. Through this curriculum, students earn beads after mastering the song associated with the bead. The highest bead that can be earned is black. Recorders are provided by the school. 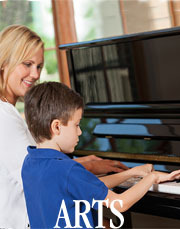 However, investing in one that your child is excited about will improve their practicing and motivation. Fifth and sixth graders will have the option of pursuing band or general music. Fifth graders may choose a band instrument that they will commit to for the year. Sixth graders may choose band if they have already had one year of instruction on their instrument. Students choosing not to participate in band will receive general music instruction including movement activities, musical appreciation, and Orff instruments.